Thunderstorms may not seem like much, but they can actually lead to some serious damage. A thunderstorm is considered to be severe once it produces either hail that is an inch in diameter or wind gusts that reach 58 miles per hour. All thunderstorms produce lightning, which actually kills more people every year than hurricanes or tornadoes. But perhaps one of the scariest things about thunderstorms is that they can cause flash flooding and high winds, meaning that your home could collapse, your basement can flood, and trees can topple down to damage your neighborhood. Once a severe thunderstorm is a possibility, the area will usually be put under a severe thunderstorm watch. When this happens, make sure you are paying close attention to the weather updates and stay ready to act. However, a severe thunderstorm warning means that spotters or a radar have found that there is a thunderstorm nearby. These warnings can mean that the storm is dangerous to you, your family, and your property. Every year, people are injured or even killed from thunderstorms even though they were given advance warning. Do not take these warnings lightly; always take timely action to save yourself and your loved ones. 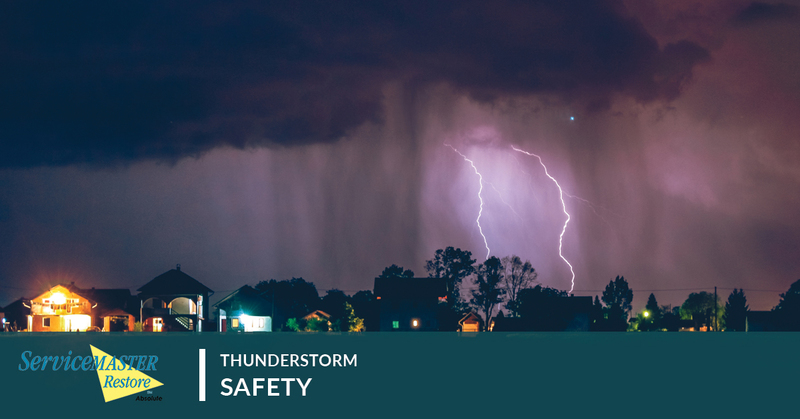 Talk about thunderstorm safety with your family and friends. Lay out a plan. Select a safe place in your home for everyone to gather during a storm. It should be away from windows or anything else that could be broken by hail or strong winds. Make a list of items that need to be brought indoors if a thunderstorm hits. Protect your greenery by keeping trees and bushes trimmed and pruned. Keep animals safe that do not live in your home by making sure your outdoor buildings are strong and offer protection. Get trained in first aid so you know what to do in case of an emergency. What can you do when the thunderstorm arrives? The answer is more than you may think. Make sure to listen to the local news or the weather radio stations to receive emergency updates. However, also rely on what you see outdoors. If the skies are dark, the wind is picking up, and you spy lightning flashes, the storm has arrived! Make sure to postpone any outdoor activities that were supposed to take place once you hear about an impending thunderstorm. If the authorities issue a severe thunderstorm warning, make sure to take shelter! Get out of any San Diego mobile homes that could blow over from the high winds. Once you can hear thunder, that means you are within range of danger from lightning. Go indoors immediately! The National Weather Service encourages people to stay inside for an additional 30 minutes after they hear the final thunderclap. Do your best to stay away from electrical equipment and telephones. We recommend finding battery-powered radios and TVs to stay up-to-date. Stay away from any windows in your home! Also, make sure all your outside doors have been closed securely. A thunderstorm is not the time to take a bath or shower, or even to use the plumbing. Avoid doing so if possible. For those of you on the road, try to exit the road and park. Stay in your car and turn on your flashers until the heavy rain ends. Try to avoid touching any metal surfaces both inside and outside the car! For those of you who are outside and cannot reach a safe building, stay away from the higher ground, standing water, tall trees that are isolated, and metal objects. A picnic shelter or shed is not safe. Make sure to still keep your safety in mind after the storm has passed. For example, if you spy a flooded roadway, don’t just try your luck. It’s possible that the water is much deeper than it appears, and your car may not make it through. This is dangerous to you, but it can also cause serious damage to your car. Also, do your best to avoid storm-damaged areas. These places can put you at risk of falling tree branches or other damaged property that could seriously harm you. We recommend that you keep listening to the radio to see what updates are available. In serious situations, they will also provide instructions and guidance as to what areas of the community have been shut down. You never know where a tree may have fallen, meaning that you’ll have to reroute your path entirely. We recommend staying as far as you can from downed power lines, as well as reporting them. The sooner the authorities know about the hazard, the less likely it is that someone will become seriously injured. Keep an eye on your pets and other animals, as after a thunderstorm is a common time for animals to run amok. Finally, make sure to help those who will need extra assistance, such as children, the disabled, or the elderly. If someone has been struck by lightning, make sure to call for help. This person will require immediate medical care. After calling for help, you can check the person for burns and injuries. If they have stopped breathing, perform CPR until help arrives. However, if they are breathing normally, check for other possible injuries and provide care the best you can. Don’t worry—people who have been struck by lightning do not retain electrical charges. You will not be harmed by handling and helping them. Finally, reach out to your family and let them know that you are safe. They will appreciate the update and know to contact you for more information about the situation. Was your home damaged in the thunderstorm? Perhaps your basement flooded unexpectedly, and now you are faced with a messy cleanup. When this is the case, it’s important to act quickly. The longer the water stands, the worse the damage could be to your foundation and the rest of your home. It’s time to take action, and fast! If you are looking for assistance with this mess, we recommend calling your location San Diego professional at SM Absolute. Our team is experienced and prepared to handle any water damage repair situation that your home may have. Reach out to us now to get started! We look forward to helping you reclaim your home, even after the worst of thunderstorms. We can also communicate with your insurance company to make sure that your property is taken care of. SM Absolute’s team can be there within the hour of your call, so call now.